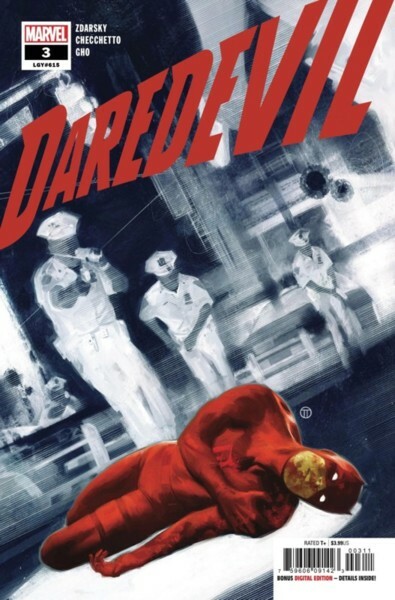 What did you think of DAREDEVIL #3? DAREDEVIL #3 by Zdarsky, Checchetto and Gho ships March 27th and here's a preview. Cover by Julian Tedesco. Please use this thread for all discussion when the issue ships! Great issue. I hate cole soo much. There’s nothing as frustrating as a guy who’s decided that the heroes a villain and that he’s morally superior to all around him. The way i see it there are four ways to go with cole. He can see the error of his ways and become an ally ( aka the most boring way) he can go fully evil and maybe even become a supervillain, he can leave force in disgrace never to be heard from again or he can stay on as a supporting character and frequent foil. As wacky as it is and even though it doesn’t fit the tone zdarskys establishing i do think this could be the beginnings of a pretty good origin story for a pretty good villain but as long as he doesnt have a change of heart and team up with dd to fight fisk then i’m ok with whatever direction he goes in. So I'll admit I'm a little confused. In the last issue Matt thought to himself, "It took me a while to bounce back from my injuries, but I did." Then he was shot by Detective Cole, which shouldn't have been able to happen if he had fully bounced back. This issue was a very tense read, watching Matt be so severely manhandled like this. The thrashing Matt receives is along the same level Fisk gives him in "Born Again", or Bullseye gives him in "Guardian Devil." When Matt claimed to have "bounced back," was he lying to himself? I hope so. As unpleasant as it was seeing Matt lose a fight so badly, Zdarsky and Checchetto are still doing an amazing job. Every character is on point. The glee with which Fisk takes this all in is perfect. Matt sliding Cole's gun along the pavement was a great moment. The respect Daredevil has earned amongst the police force was fantastic. I don't think Punisher killed Cole, although it certainly looks possible. He wouldn't kill another cop, although he endangered a ton. Also, the way Zdarsky has set up Cole, it would be a waste of a compelling character. It's a bit odd that Frank was able to get away with Matt, but he is the Punisher. Another great issue, but it's held back for me because I have to buy that Daredevil was shot in the last issue, and I don't think Cole should have been able to hit him. Four stars. I really loved this issue so much! I didn't like Cole beating up Daredevil after already getting lucky by shooting him. I'm also not thrilled for yet another Daredevil/Punisher morality debate. It's been done to death so I hope Zdarksy does something new with their relationship. Was really hoping Elektra saved him. I'd like to see her have a permanent role in his series. I know people say her story has past but I think there's a lot to tell with them. This series definitely started off in a very dark place. Matt is very much broken. I didn't necessarily expect him to go to jail but, if he was going to escape, I didn't think he would fail so spectacularly. There are nice moments throughout but it's the ending that really matters. I'm curious what it sets up. As I said, Matt is broken. But I don't want him to stop being who he is. I know each writer likes the idea of exploring Daredevil vs. Punisher. This one is a bit different because of where Matt is. He's ripe to take the viewpoint of his rescuer, but I hope he ultimately doesn't go too far down that path. Zdarsky, to me, seems to have such a strong sense of who Daredevil is that I strongly doubt Matt is going to throw out his entire belief system. Excellent issue, it was really suspenseful to read and kept me on the edge the whole time. Similar feeling for me when I originally read the Murdock Papers arc during Bendis' run. I can't wait for the next issue! Agreed with the other comments that Zdarksy has done a great job in creating the character of Cole in such a short period of time. I really don't like him and I mean that in a good way! He seems to also understand Matt quite well and I am excited to see where this headed. Art also continues to be absolutely stunning! The only call out I have, and I wouldn't even call it a negative more of just a personal preference. While I am intrigued with how Zdarksy will handle the Matt vs. Frank moral debate, it's something that had been done A LOT! I would have preferred him to use Elektra or Natasha instead as they would also be able to have the similar moral debate and would bring there characters back into the book, especially Natasha who has been absent for awhile.